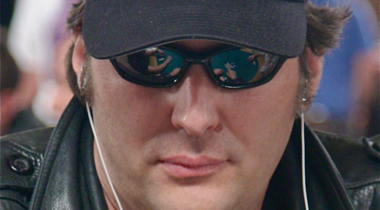 Phil Hellmuth is eyeing bracelet #13. 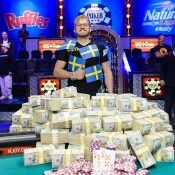 Monday is shaping up to be a big one at the 2012 WSOP. Three bracelets should be awarded, and all have major names in contention. Here’s the latest. :: Event #29 ($1,000 NLH Seniors) – This played down to four remaining before they all had to take a 4:30pm dinner break and be in bed by 7. Two-time Main Event champ Dennis Phillips holds the chip lead with 5,335,000. He’s followed by Bob Phelps with 3,475,000. Hoyt Corkins (1,960,000) and Allyn Jaffrey Shulman (1,620,000) also remain. Solid final four there. :: Event #30 ($1,500 2-7 Lowball) – Larry Wright outlasted a stacked final table to claim his first bracelet. Wright earned $101,975 for the win. Brandon Cantu came in second ($63,048), LUCKY CHEWY (what a wookie) came in third ($41,445), Michael “The Grinder” Mizrachi was fourth ($28,198), and Erick Lindgren was fifth ($19,676). Get full results here. :: Event #31 ($1,500 NLH) – The field of 2,811 is down to 19. Leading the way is 2009 WSOP ME champ Joe Cada with 1,869,000. Also among the remaining are Cherish Andrews, a woman (1,383,000), the spectacularly-breasted JC Tran (339,000), and the man the myth the legend, Black Phil Ivey, Big Sldick, the one and only Dwyte Pilgrim (293,000). Get full chip counts here. :: Event #32 ($10,000 H.O.R.S.E.) – The starting field of 178 is down to 15. John Monnette is making another run at 2012 WSOP bracelet #2, as he’s currently big stack with 825,000. 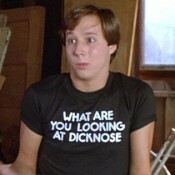 He’s followed by David Bach with 645,000. Phil Hellmuth is fourth overall with 571,000. Also alive, albeit among the short-stacks, is Phil Ivey with 102,000. This event should carry major WSOP POY implications, as Monnette, Hellmuth, and Ivey are all currently in the top 10. Get full chip counts here. 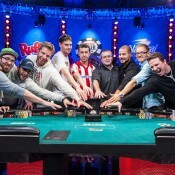 Get extended WSOP coverage over at BLUFF here.